Admittedly, I got tired watching Filipino drama series shown on Philippine TV. The story lines are so repetitive that it diminishes the element of surprise which is a key ingredient in literary appreciation. Instead of the suspense killing the audience, familiarity with the story line kills the suspense then bores the audience. Then came GMA 7’s TV series “The Confession Wives” (“Ang Dalawang Mrs. Real”). It’s a story about a philandering husband who married another woman. After going over its synopsis, I said “nothing new.” So, I did not bother to watch… until my wife asked me to find on You Tube the episodes of the said TV drama that she missed. With nothing else to do I decided to peep on what she’s watching. Result: For the first time in years that I eagerly watched a Filipino drama series. Elements of the rising action are beautifully put together as the story geared towards the climax. The climax itself was something unexpected. I have a penchant on rightly guessing how things would turn out in a story but this one had me wrong several times. It is different because the whole story is a realistic rendition of life. And this is exactly what literature is… a faithful reproduction of life. 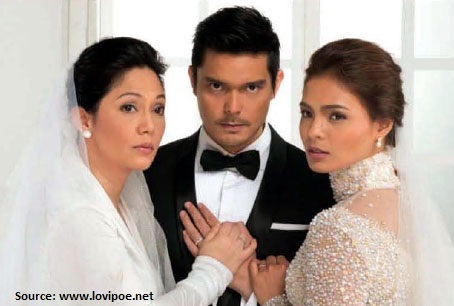 Anthony (Ding-dong Dantes), the husband, is the embodiment of the popular belief about men – “that men are polygamous in nature.” Henry (Robert Arevalo) and Tino (Tommy Abuel), fathers of the two women married by Anthony, are themselves not clean. Both of them have had extra-marital affairs themselves. Among men in many parts of the world, womanizing seems to be a natural thing. In real life, we criticize people for the things they say and do. We do the same in the drama series, we pass judgment on the characters. The lesson is clear, when you do something wrong, brace for the consequences. I agree with that! But I’m jus curious, why Confession Wives? Hi Jef! Agreed with what? “Confession Wives” is the the English title GMA 7 gave for “Ang Dalawang Mrs. Real” for international release. …or it could be that the TV series was titled that way in English because the husband in the story admits (or confesses…or gets caught and confesses) having two wives. I don’t know if it was better had the writer just literally translated the title (in Filipino) “Ang Dalawang Mrs. Real” to English. It could have been “The Two Mrs. Reals.” It could be an attempt of the writer at a catchy English title for its international release. Would “My Two Wives” as at title been better? For me, the philandering husband should be punished. There’s no justice without restitution. They should be. This story focuses on how unfaithful a husband could be. One thing that I just observed on stories about unfaithfulness is that usually the guilty party are men. Rare are stories that show that women are also capable of infidelity. One movie that comes to mind is “Unfaithful” starring Richard Gere and Diane Lane. Not being harsh, but I’ve witnessed how devastating cheating is to the family. It’s almost always life – changing. Hi,am Jennifer.Adultery and Cheating is not good.it cn destroy a whole family and even the trust. Yes Jennifer. Cheating ruins relationships. Some situations cause men to lie and cover the whole story just to rectify everything. Both men and women are capable of cheating. Men are just more vocal about their infidelity thinking that it makes them look better if people would know that they have multiple partners. Thus, we think that there are more cheaters among men than women. Conversely, women are secretive. We’ll never know who cheats more – men or women. This is just my opinion. I maybe wrong… but I maybe right.